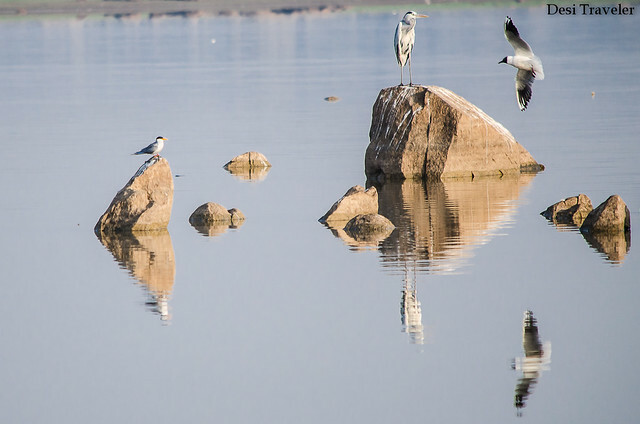 Recently we went to look for Flamingos in Gandipet or Osman Sagar one of the bigger lakes among the lakes encircling Hyderabad, some of these lakes are natural and others were specially made or enlarged during the reign of the Nizams to ensure water security. 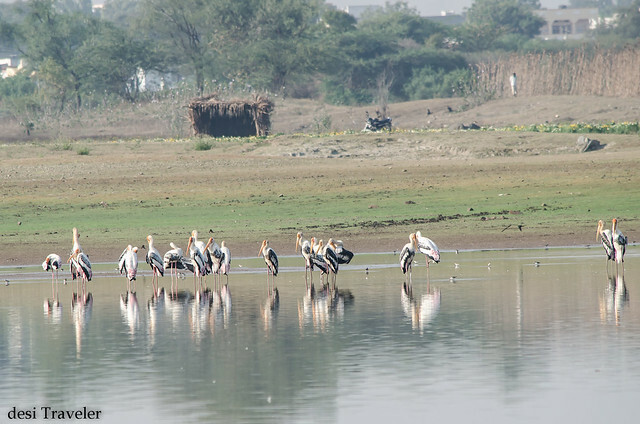 Over period lakes like Gandipet, Manjeera, Pocharam, Ameenpur, Shamirpet, Peerancheru etc have become a natural sanctuary of local as well as migrant birds. These visits were part of a GHAC Nature club and we visited Gandipet Lake twice in last one month. My main purpose was to observe pink Flamingos as some sightings were reported by other birders. As you will see in some of the pictures below, Flamingos are one of the most beautiful and graceful birds. Every city with a nightlife worth talking or reading about has a club or restaurant named Flamingos ( don’t believe me go Google it 🙂 ) Unfortunately the numbers of Flamingos around the world are reducing due to poaching for their beautiful feathers, meat and habitat destruction, so when we heard about Flamingos sighting in Hyderabad we were really excited. How to Reach Gandipet: The Google map gives some strange directions for Gandipet but you need to simply reach the Chilkur Balaji Temple by taking exit 18 from ORR and then follow the road to Chilkur Balaji Temple. Park in temple parking and then just walk about 300 meters behind the temple on a path littered with bottles, plastic bags, and other urban filth to reach the lake bed. We were greeted by a small Ganesha idol kept on a platform. It is one huge lake though not very deep as we could see flamingos and other birds walking in the lake bed. We split into two groups and one group walked towards the flamingos and we walked the other side. We saw a lot of Painted Storks, River Tern, Grey heron, Greater Flamingo, Brown-headed Gull, White Ibis etc. Click on this link here for a complete list of birds seen and here seen on the second visit. By the time it was our turn to visit the Flamingo side of the lake most of them have flown to the other end and were too far to click any pictures. We could have gone towards them to click pictures but I personally feel it is unethical to chase birds for clicking pictures and no picture is worth chasing a bird or disturbing them in what they are doing. The aim of a bird photographer should be to click pictures without disturbing the bird at all, even if it means missing some shots, then let it be. But coming back to Flamingos, it is a surreal experience seeing hundreds of flamingos feeding together in a distance, some of looking for feed in water, others looking around for predators, and while some others just enjoying the sun while standing on one leg. 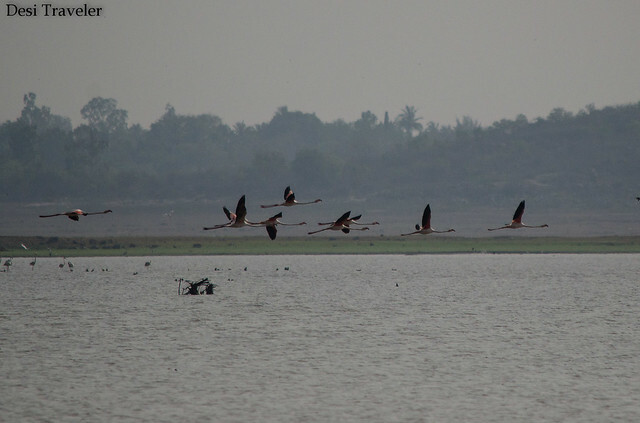 For some reasons the flamingos we saw were not very bright pink in color, probably because the water in Gandipet does not have that particular bacterium rich in beta-carotene that gives the Flamingos their pink color. —As it was getting hot we decided to come back again after a few days and reached again Gandipet in the middle of March. This time we took a back route to go to the other side of the lake. 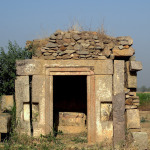 For this you need to take a parallel road to Chilkur Temple and reach a small village just before you will see a water tank on the Chilkur Pragati Yenkapalli road, it is a kuccha (unpaved ) road and landmark is a small bus stand on the kuccha road leading to the village. You can drive almost to the lake bed, provided you are willing to risk your car getting stuck in the drying mud of the lake bed. But I would not suggest this route for two reasons 1. It is easy to get lost in the back lanes of the village and there is no proper parking and it may be unsafe to leave your vehicles almost a KM from the lake. 2. You are on the wrong side of sun hence cannot click any pictures if you visiting the Gandipet lake in morning. Anyways in our second visit I was slightly lucky and was able to click some pictures of Flamingos, but since we were on the wrong side of the lake with sun shining brightly on our lenses the Pink color of flamingos has not come properly so I thought I will use B&W pictures to try to make them a bit artistic. 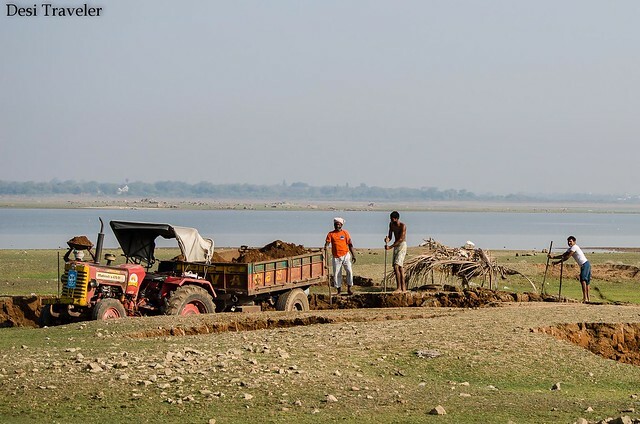 During both our visits we found some laborers digging soil from the dried part of the lake, on questioning they told that they are taking the soil to fill ditches in the village for a government project. I wonder what kind of smart government officers we have who allow digging nutrient-rich soil from one of the endangered lakes of Hyderabad, that plays host to migrants like Flamingos to fill ditches. Something is seriously wrong in our conservation efforts unless the laborers told a lie and are part of some illegal sand mining gang. 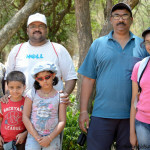 As I was not very happy with the pictures I have clicked I requested Dr. Jagan Pannala, an avid bird watcher and Sr. Lecturer of Zoology in Sri Chaitanya Junior College to share some of his pictures to be published on this blog. He kindly agreed and the next two awesome pictures that you see have been clicked by Dr. Jagan, do check more of his work on Facebook and Flickr. Point to note: Gandipet is the original name of the village and the surrounding area, the Gandipet Lake is also known as Osman Sagar. 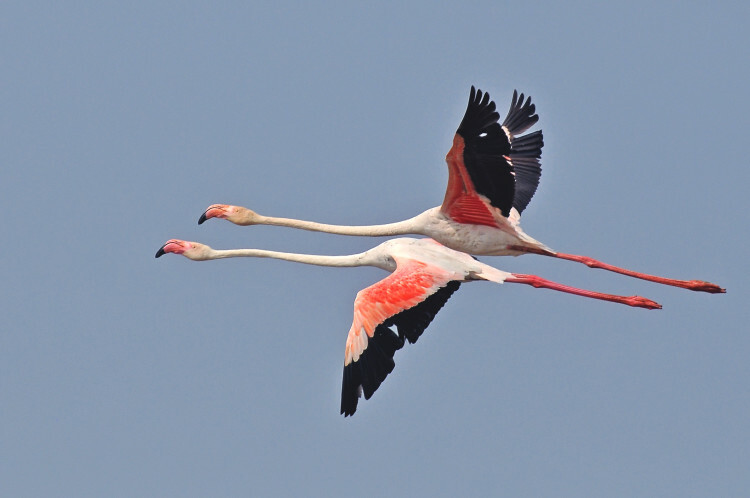 Flamingos are migrant birds in most part of India and as a signatory to treaty on protection of migrant species, we should not try to get too close or capture Flamingos as they are wild birds who like to maintain there distance from humans, so we should respect that. 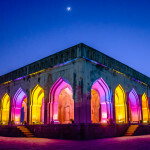 How to reach Gandipet or Osman Sagar: The google maps will take you to the touristy side where all you will find is well tourists. If you want to see Flamigos and other birds, the best way is to reach Chilkur Balaji Temple, park there and walk to lake. Once you have parked your vehicle ask any street vendor or parking attendant on how to reach Gandipet lake. Follow this customized map to reach there. 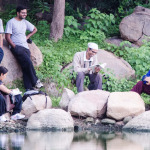 The route is simple while coming from ORR or Langar Hauz, take exit 18 on Chevella Road, cross Mrugavani National Park and take right towards Chilkur Balaji Temple. Once you are at temple you will be able to walk to the lake from a small but well defined path. Those two flamingos flying together is a smashing picture. The water looks like glass. Beautifully captured! Thank you very much for this nice post. The information about flamingoes being found in the outskirts of Hyderabad is quite new for me. And of course, awesome snaps . 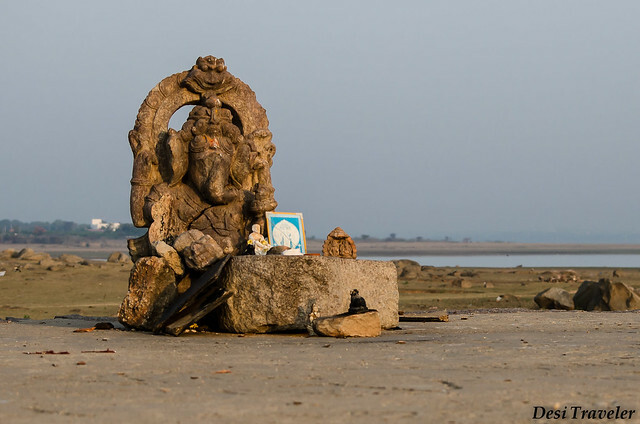 . .
Beautiful Flamingo images, specially second last one is simply stunning…Ganapati idol on the banks of lake, I wonder how it got placed there and when? You captured it very well, feels very peaceful. 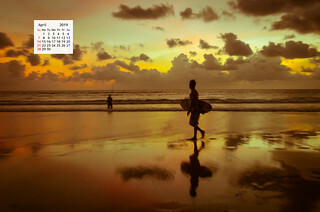 those photographs are simply amazing including the ones which you clicked! ganesha idol on a platform is quite unique! a wonderful read with lots of information! The lake looks so serene and the flamingos look pretty. Wonderful captures! OMG ! I am astonished and overjoyed. lovely pictures and lovely place . The beauty of flamingos has made me speechless and the way you have captured , its simply amazing. Which camera do you use ? Thanks a lot for your kind words Vishal.. I use Nikon D 7000 body with Nikon 300 mm, 4.5-5.6 VR-lens for bird photography. The panoramic photos have turned out very well. I didn’t know there were flamingos in Hyderabad. Interesting. Sad to read about the laborers stealing soil… it has to illegal and govt officials have probably been paid off. If this sort of thing continues, which is happening all over India, pretty soon there will be no wildlife left in the country. The illegal soil/sand mining is a big problem and one of the bird watches in group Rashmi is planning to take it up with authorities. The illegal soil/sand mining is a big problem and one of the bird watchers in group Rashmi is planning to take it up with authorities.